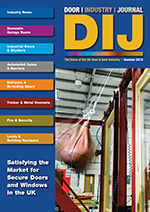 The Door Industry Journal is an independently produced and edited trade publication, published on behalf of the door and automated gate industries. The content covers these sectors of the above industries: garage doors, industrial doors, entrance doors, doorsets, fire and security, powered gates, building hardware, ironmongery and locks. Also included is relevant content on complementary products and services. 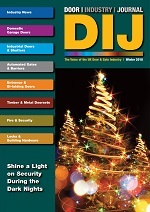 Three issues are produced each year in printed and digital form, publishing in Spring, Summer and Winter - April, August and December. 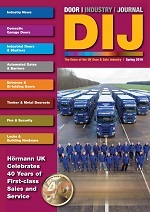 Published on 28th March 2019 featuring a lead story on the 40th anniversary of Europe's leading door provider Hormann UK. 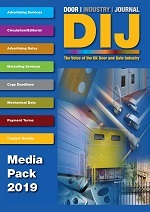 Our 2019 Media Pack provides all the information needed on rates, package deals, copy dates, technical and mechanical data. Please click the image on the left or the link below to view the media pack online.